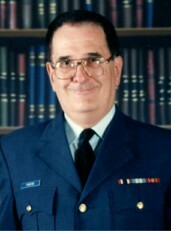 Scott Hurst Forster had a distinguished, 40-year career with the Canadian Armed Forces. Born in Toronto in 1942, he graduated with a B.A. degree from York University and an LL.B. degree from Queen’s University. Scott enrolled at the Royal Canadian Military College in 1964, and served three years as a Pilot Officer, Reserve in the Royal Canadian Air Force (RCAF). In 1967, as a newly minted lawyer, he joined the Office of the Judge Advocate General (JAG), the senior judicial authority for the Canadian Armed Forces. For the next 30 years, Scott served around the world in a series of increasingly responsible positions with commensurate rank. He was a Legal Officer for Trenton, Ontario; National Defence Headquarters in Ottawa; Bonn, Cologne, Soest and Lahr in West Germany; the Royal Canadian Navy base in Victoria, B.C. ; and the Royal Canadian Army base in Gagetown, N.B. He was stationed to United Nations bases for peacekeeping missions in Cairo, Egypt and Nicosia, Cyprus, and subsequently appointed Assistant to the Judge Advocate General for the Prairie Region, Northwest Territories and Northwestern Ontario. He appeared on behalf of the Crown in Court Martial Appeal Court in Edmonton, Calgary and Winnipeg. He attended Staff Officer School for Intelligence Gathering, and Staff Officer College for Strategic Planning, both in Toronto. Scott was ultimately posted to National Defence Headquarters in Ottawa, where he was appointed Deputy Judge Advocate General and Director of Legal Services Claims, Defence and Prosecutions. He retired in 1997 with the rank of full Colonel. From 1997-2004, Scott served on the Veterans Review and Appeal Board (VRAB). Based first in Charlottetown, P.E.I. and then in Ottawa, he travelled across Canada hearing and presiding over appeals. In 1971, Scott married Dawn Stevens after a whirlwind courtship. Over the decades that followed, they proved to be a fun-loving couple and a formidable team. Dawn adapted superbly to their life in various locations while maintaining her own career in the travel industry. In 1999, Scott and Dawn moved to Cobourg, Ontario. Scott retired from VRAB in December 2004 as a result of health issues. In August 2004, he had suffered a devastating stroke. For the next 14 years, Scott and Dawn battled valiantly to regain Scott’s quality of life, including dealing with his further diagnosis in 2014 of lung cancer. Scott had the heart of a lion, and maintained his courage and his fight to the end. Friends are welcome to join the family for a Celebration of Life Wednesday June 20, from 2 – 4 p.m. in the MacCoubrey Funeral Home Reception Centre. Wednesday June 20, from 2:00 p.m. to 4:00 p.m.